When we left you last week, we were on the verge of participating in our first Relay For Life. Friday after work, we stopped by the relay venue to get an idea where our team’s site was and where we’d park our Scotty for the weekend. 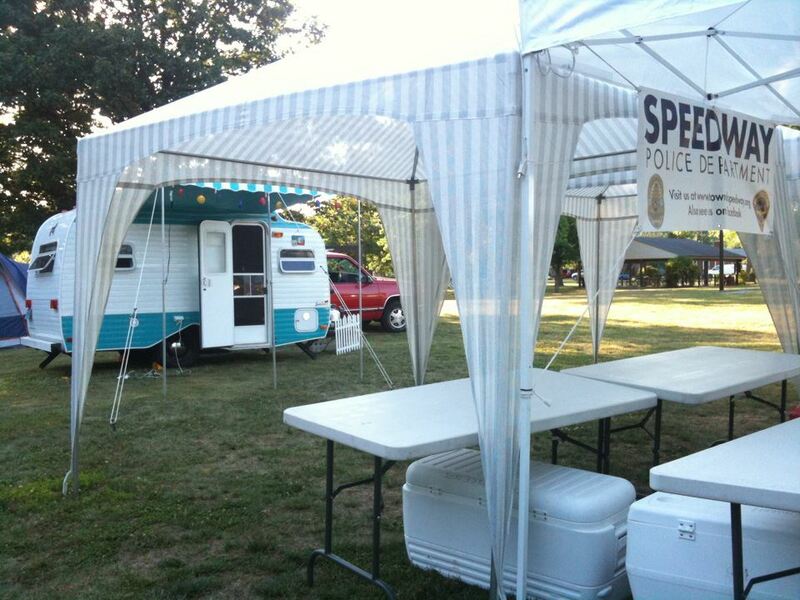 The officers of the Speedway Police Department did a fine job of leaving us a nice spot between the pop-up awnings and tent to park for the weekend. We returned a couple of hours later to set up shop. There was one other participant there for the evening who was providing security for the venue, since most of the 35+ teams had a tent and/or awnings set up, but no one else was camped out Friday night. With nothing much to do after getting our site set up, we decided to head down to Sam’s Club to pick up a memory foam mattress topper for the Scotty, since we had a little extra in our camping budget and have meant to get one for a while. Wow, what a difference that 2 1/2″ of foam did for my sleep! Look for a “Gadget Review” on that later. After a late night walk over to Speedway’s Main Street for some frozen yogurt at Yogulatte, we called it a night, as we knew we’d need a lot of rest prior to the Relay. The Relay began shortly after 10am Saturday and that’s when the fun began. I didn’t know what to expect when I signed up with my wife to do this, but I’m sure glad I did. It had a festival atmosphere to it, and with Speedway being a town of just over 12,000 residents, it wasn’t often you didn’t see someone you knew. 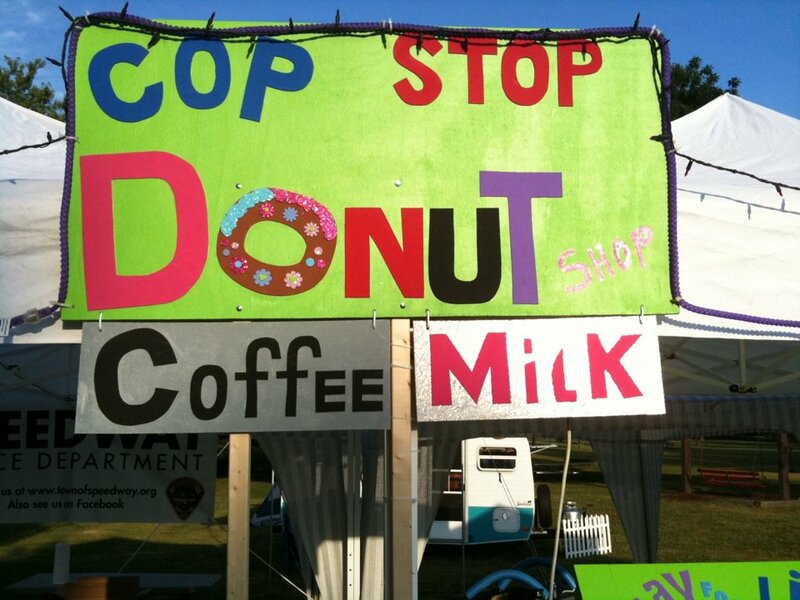 The Speedway PD team poked a little fun at themselves with the name of their tent where we served up some milk and legendary Long’s donuts in the morning and some grillable meats in the afternoon. Every hour there was something going on while the hundreds of walkers were mobile. Our group was busy selling food & drink, as well as “arresting” unsuspecting participants who were issued “warrants” for $5 by friends & family members. 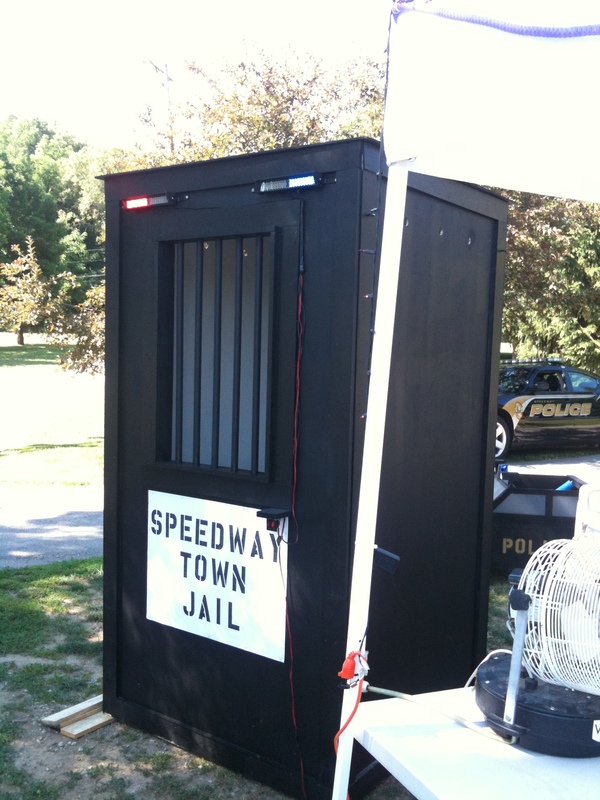 As each criminal was found, they were brought back to our site in handcuffs by one of Speedway’s finest and thrown in the Speedway Town Jail where they stayed until $5 bail was posted. 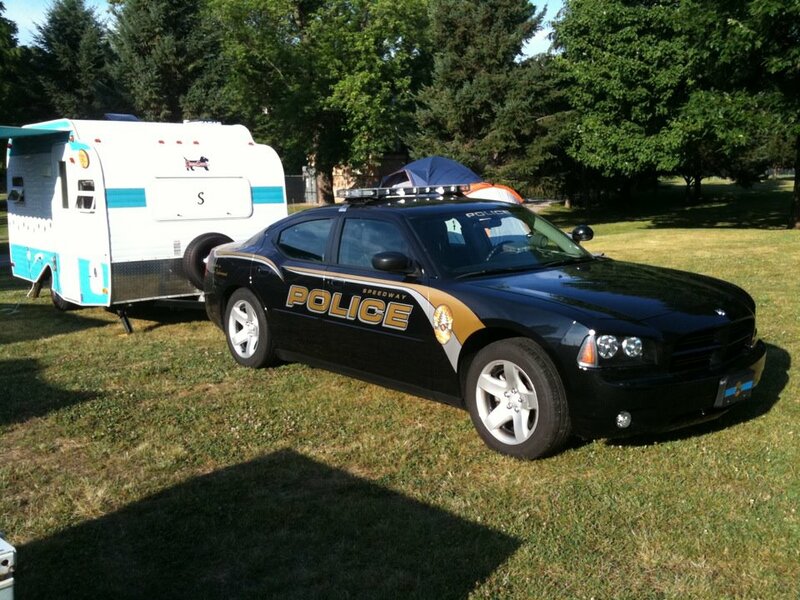 It was a HUGE hit and our officers couldn’t keep up with the number of warrants issued. As sunlight diminished for the day, the number of walkers didn’t. 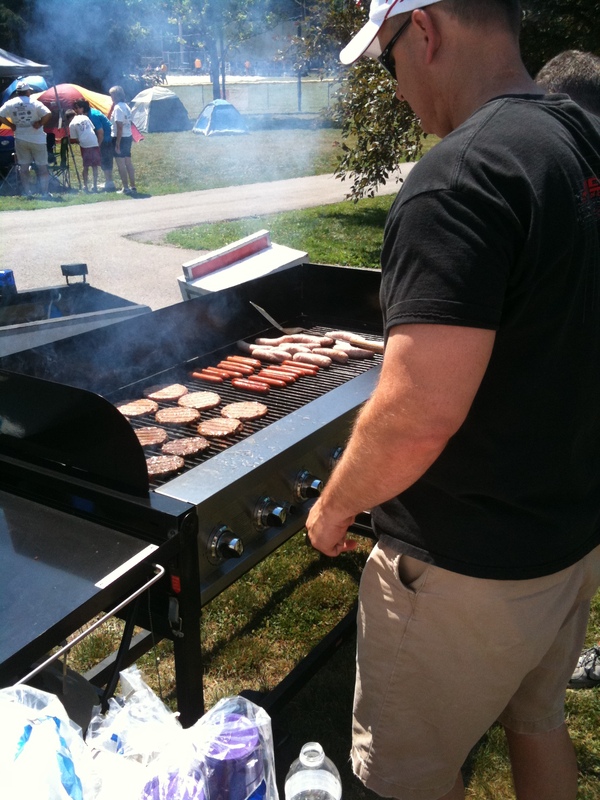 It created a rush of diners looking for more hotdogs, burgers, and brats we had on the grill. Luminarias were lit in memory of loved ones who either lost their fight to cancer or were fighting it. The hundreds of luminarias along the 2 tenths of a mile course had the names of those loved ones on them, as well as personal messages to them. There were a lot of emotional moments Saturday night, from the lap the cancer survivors took together to the solemn end of the Luminaria Ceremony where everyone shut down their campsite lights and watched as hundreds walked along the path of luminarias as a bagpipe player played “Amazing Grace”. I managed to stay up the whole night. Everyone on our team either went home for a few hours of sleep, or in my wife’s case, found slumber in the Scotty. I found I needed a shot of 5 Hour Energy around 2:30am to keep me awake, which was my goal, in honor of those who are in a fight for their lives who know that cancer never sleeps. I ended up walking nearly 2 hours off & on throughout the night (a little less than 4 miles), and decided to call it quits just before sunrise. We started packing up shortly after 8am and after the closing ceremonies at 9am, we were on our way for the long one mile trek back home. 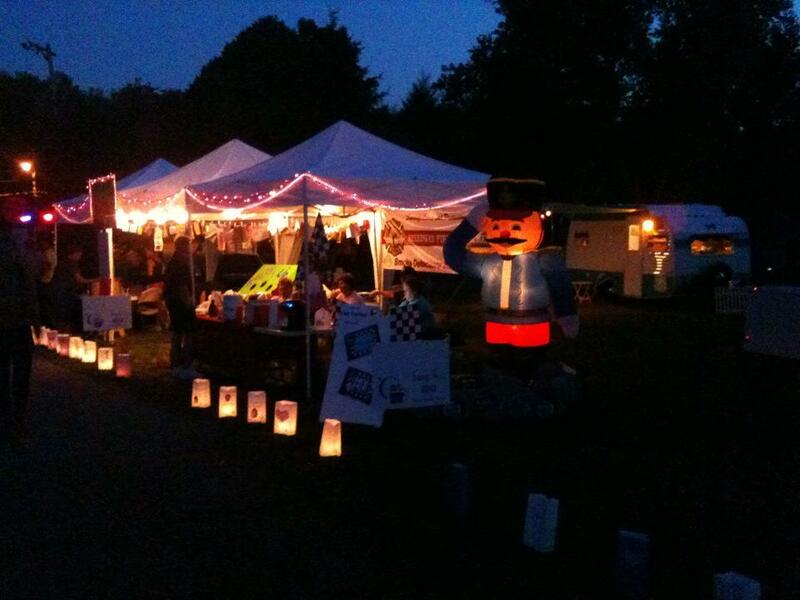 The Speedway Relay For Life (at last count) brought in over $65,000, which was a record for this event. I can’t tell you what a fulfilling experience it was to participate in the Relay. As my father has battled prostate and bladder cancer for the past 10 years (doing well right now! ), this event was personal for me, as it was for my wife, whose mother has battled breast cancer over the years. Any of you reading this who’ve participated in a Relay For Life know firsthand what an emotional event it is. And if you’ve never participated, I highly encourage you to check out the Relay For Life website and join a team or start one of your own in your area. You’ll walk away from it with a whole new perspective on life. 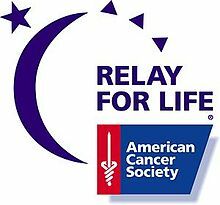 This weekend marks the annual American Cancer Society’s Relay For Life in the Town of Speedway, Indiana. This will mark the first time my wife and I will participate in this rapidly growing event. As members of the Speedway Police Department‘s citizens academy, we’re joining the relay team consisting of officers of the department. Since the relay is a 24 hour walk at a local park, the various teams set up campsites on the grounds, meant to serve as a home base where they can sit, sleep, eat, and socialize with their fellow teammates. As residents of Speedway grateful to our teammates who put their lives on the line every day for us, we’re upgrading their campsite this year by offering up our Serro Scotty as home base for the department’s team. So instead of the pop-up tents and sleeping bags, they’ll have an air conditioned oasis to crash for what is expected to be a warm weekend in the mid 80’s. This promises to be one of the best camping trips we’ve had, although our campsite is just a mile away from home. Cancer is a 400lbs gorilla that has likely affected all of us in one way or another. If you’d like to participate by a modest donation to our team, we’d really appreciate the gesture. Donations big or small can be made even after the event. Just follow the link here to our team’s page. I’ll have a full report later this weekend following the event. Thanks for your support of this event and as always, your support of The Small Trailer Enthusiast. It wasn’t long after we bought a 2010 T@B in September 2009 that we started to buy stuff to go along with it. 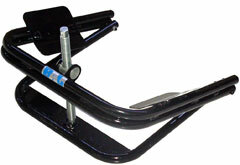 At the suggestion of more than one fellow T@B owner, one of those things we purchased was the BAL Light Trailer Tire Leveler. When we sold our T@B in 2010, we let a few of our accessories we bought for it go with the trailer…but not our BAL leveler! It’s worked just as well with our much heavier Serro Scotty (2500 lbs compared to the T@B’s 1600 lbs). One word of caution though. I’ve found the BAL doesn’t work well when parked on grass. I found some difficulty (if not just impossible) in sliding it under the tire when parked on grass, but there were no problems encountered on gravel or hard surface campsite pads. I’ve read on a few RV forums where some folks don’t like the BAL because of its bulk and how it takes up space. In my opinion, it’s a small price to pay for a handy tool. As for storage, I’ve read where more than one owner has purchased a typical pizza delivery bag and used it to store the BAL in, since it does have some grease on the threaded rod which can get things a little messy if left in the bed of your truck, or other tow vehicle of choice. We purchased our BAL from Amazon.com in late 2009. We paid about $55 for it then, but today they go for around $80. 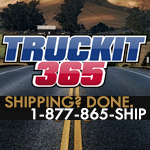 However, those prices tend to fluctuate, so you may pay less than the current $80 when you’re ready to get one. And get one you should! 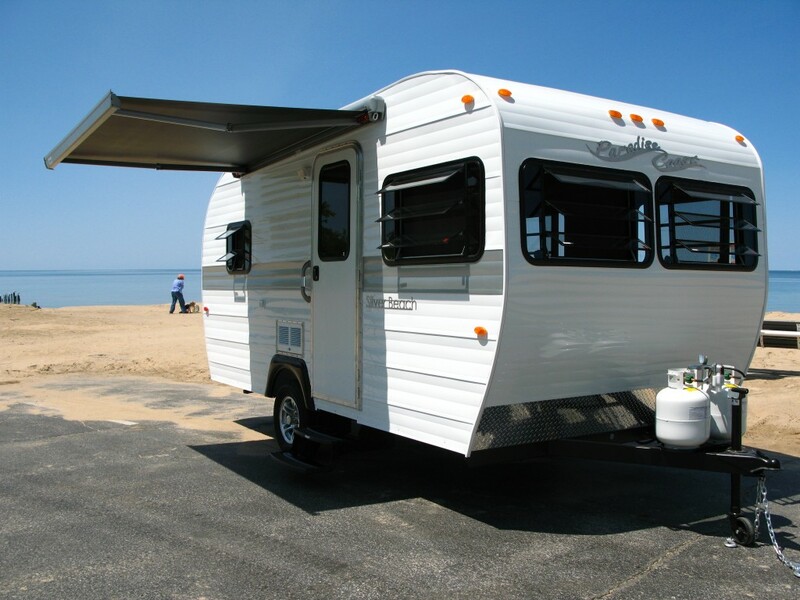 Benton Harbor, Michigan based Paradise Coast RV is set to debut the first of its line of retro travel trailers Monday, June 4 at the Mahogany Outfitters Classic Boat and Auto Museum cruise-in in Cassopolis, Michigan. A follow-up showing will be Wednesday, June 6 at the Niles, Michigan Kar Club cruise-in. The first model Paradise Coast is putting out is the 143RKB “Silver Beach”, which checks in at 17′ overall length with an impressive 7′ interior headroom, thanks in part to arched ceiling construction. One eye catching feature that I don’t recall seeing on modern travel trailers of any size is a split front window. We’ll be talking more about Paradise Coast in depth in the weeks to come, but if you’re in the southwest Michigan or northern Indiana area, be sure to stop by one of these two events Monday or Wednesday.